Inspiration — it helps motivate us to be our best, do our best, act our best, and put forth the very best that we each have to offer the world. The definition of inspiration is “the process of being mentally stimulated to do or feel something; particularly to do something creative.” But what inspires you may not inspire the next individual…. It is probably one of the most subjective concepts you can think of, and yet–in this industry especially—it is definitely one of the most important, too. This is why we here at Sew What?/Rent What? Inc. offer a variety of ways to help spark our clients’ imaginations. 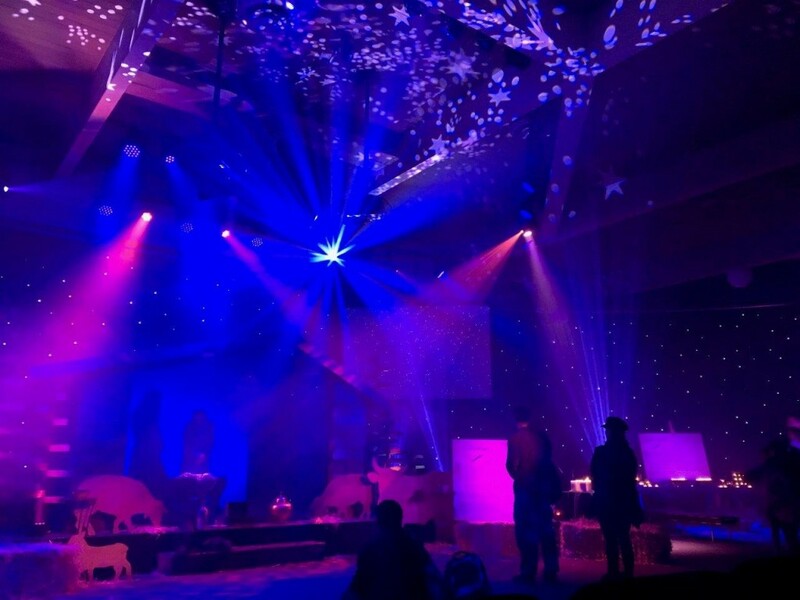 Some stage and event designers like to look at photos of theatrical draperies out in “real world” situations, which is why we have some fabulous examples of our drapes in a ton of Flickr photo albums and galleries to meet their every drapery desire. 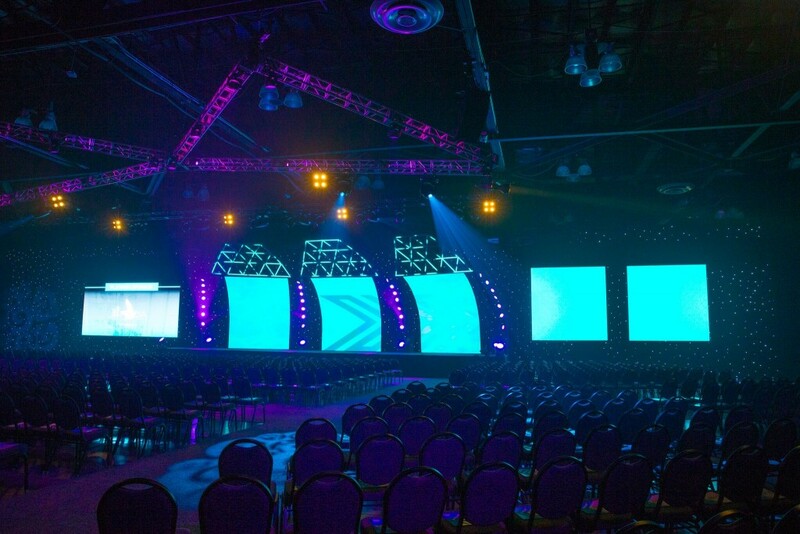 They can also explore our company Pinterest and Instagram pages to see some great examples of event and stage designs, and learn about some ingenious ways for us to help them create a similar look for their own special events. 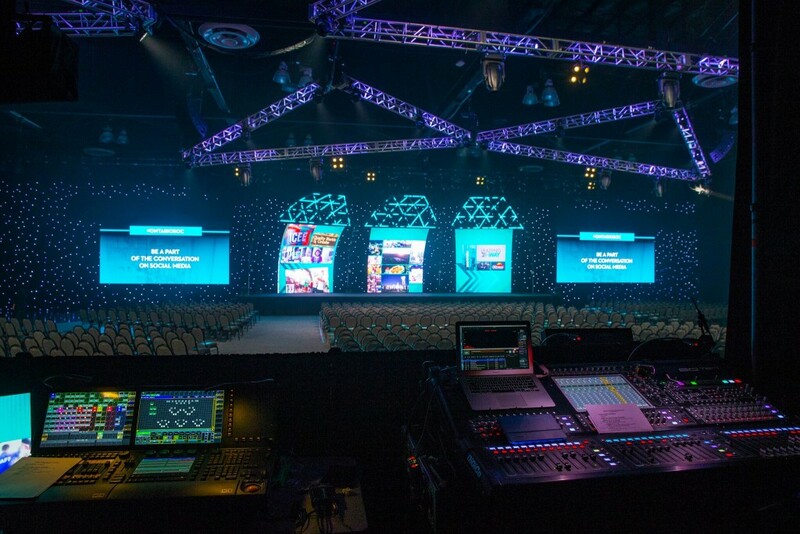 Others may do better by seeing video of the drapes and designs moving across their screen, as it helps them better imagine how the drapery and stage embellishments might look for their own creative projects. Therefore we offer a variety of different videos showcasing our rental and custom curtains on our very own YouTube channel. Some may prefer to see simple swatches of fabric or written data on their computer screen, and let their imagination run wild with that information. 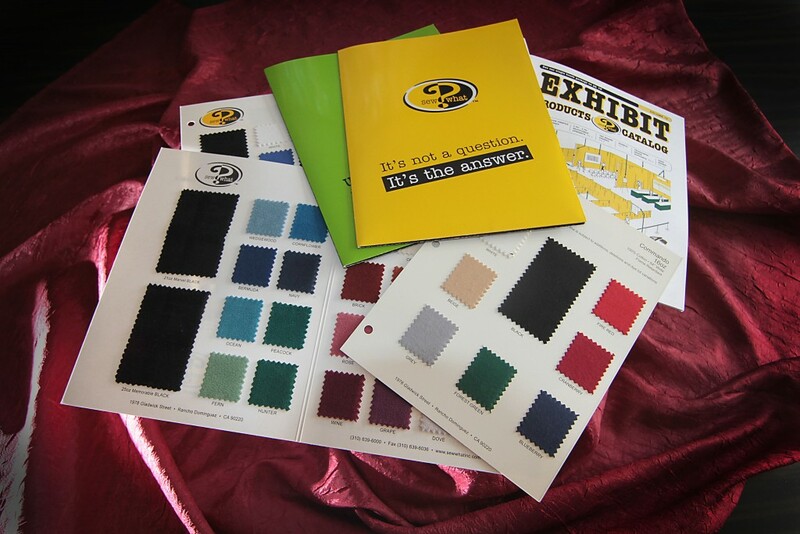 If so, they can check out our e-swatches and white papers on our website (and read this blog, of course) to gain valuable information and insight as to what type of fabric, cut, style, and substrate might work best to create the right look at their own unique event, venue, or production. And sometimes it’s as simple as being a little “social” and going to one of our many social media sites like Facebook, LinkedIn, and Google+. 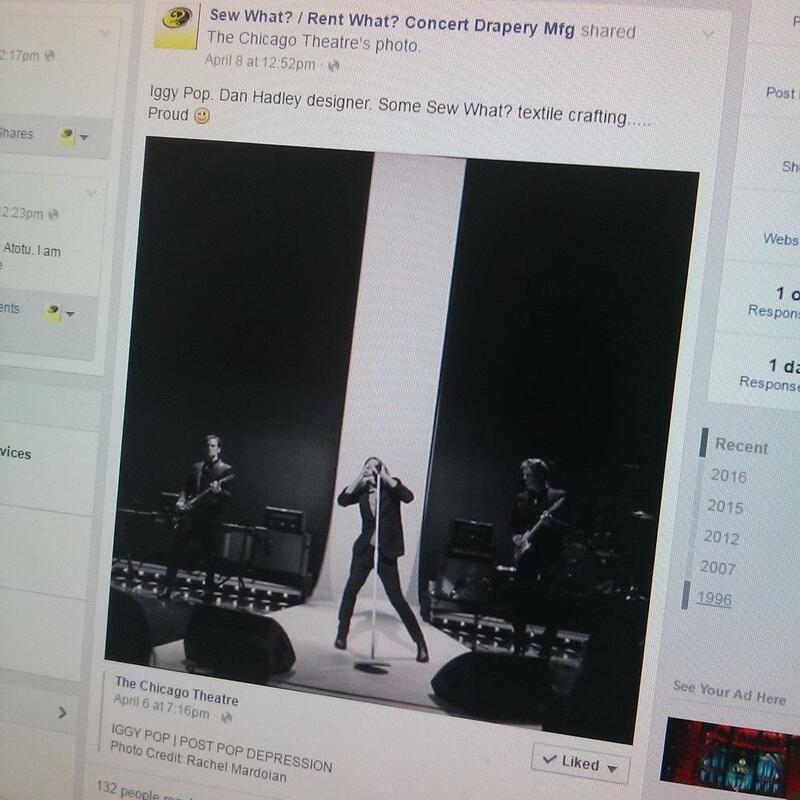 These sites are a fantastic way to easily gather information about some of our recent projects, converse with employees and other clients regarding ideas for original stage designs, and read helpful advice, suggestions, and ideas on how to they can better work within their budget, actual space dimensions, or possible time limitations. We are here in a myriad of ways for our clients—just let us know how we can better help to inspire YOU, too! 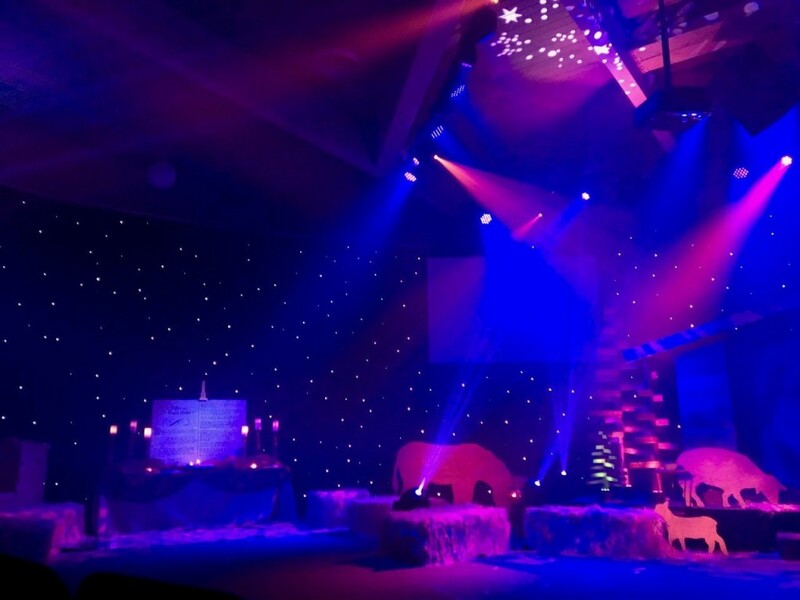 So often we have clients enquire about our rental drapes – asking which of our rental drapery collections is the most versatile for stage lighting. Hands down – we always recommend our Silver Satin Collection. This collection of rental drapes is so extensive, from theatre legs to full arena sized Austrian curtains, swaggy borders to bi-parting main stage drapes. Mix and match from our palette of silver satins and silks – and add in some black chrome illusion for the ultimate stage design. We love this variety of silver patina fabrics! The lighting scenarios that the glossy silver and pewter toned cloth offers is so extensive. 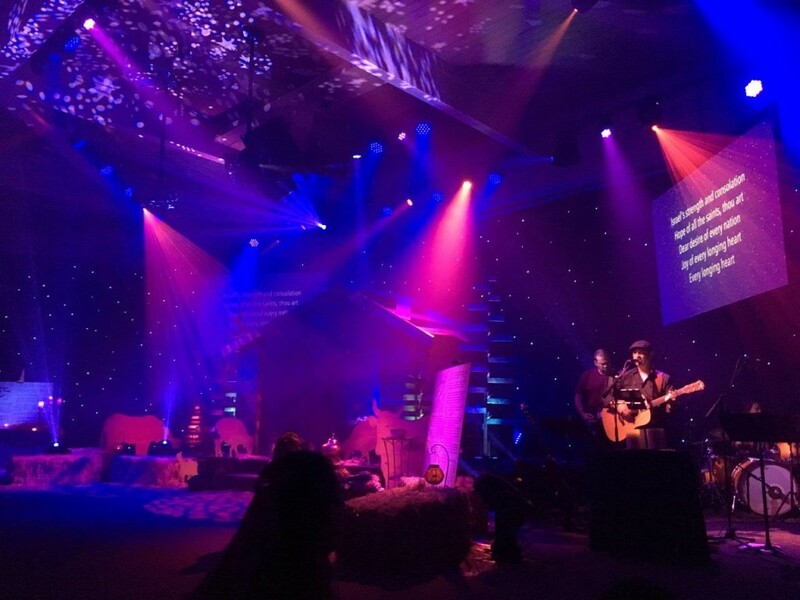 We have seen clients use these drapes in a wide variety of ways, and under variable stage lighting conditions. With so many different results, it is hard to believe that they are all the same drapes! That in a nutshell is the beauty of this collection. 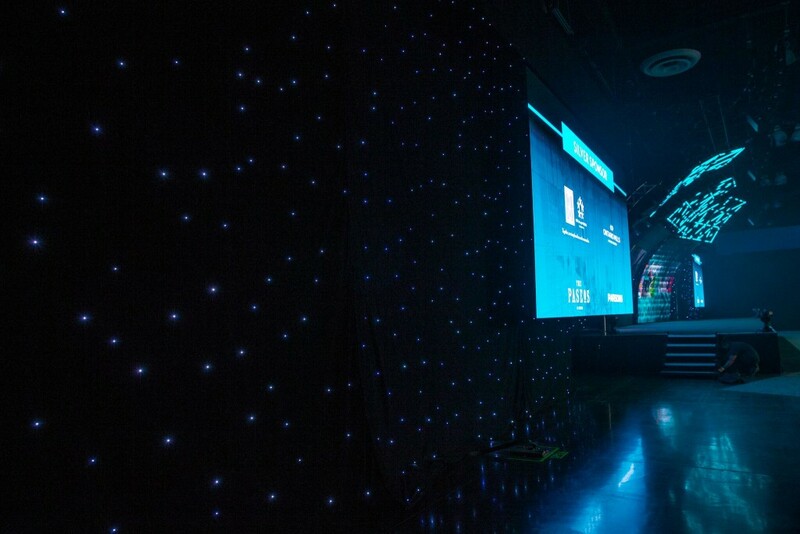 No two events or installations will ever look the same. 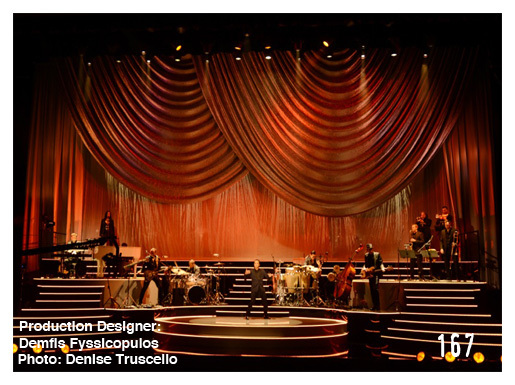 Check out Jennifer Hudson in front of this mesmerizing stage design by Butch Allen – these massive silver swags are available for rent in our inventory. Contact us for more information. Take the silver collection in the image below – here you see the same drapery elements, with a different installation configuration. Lit with burnt umber tones, the overall effect is both dramatic and vintage. 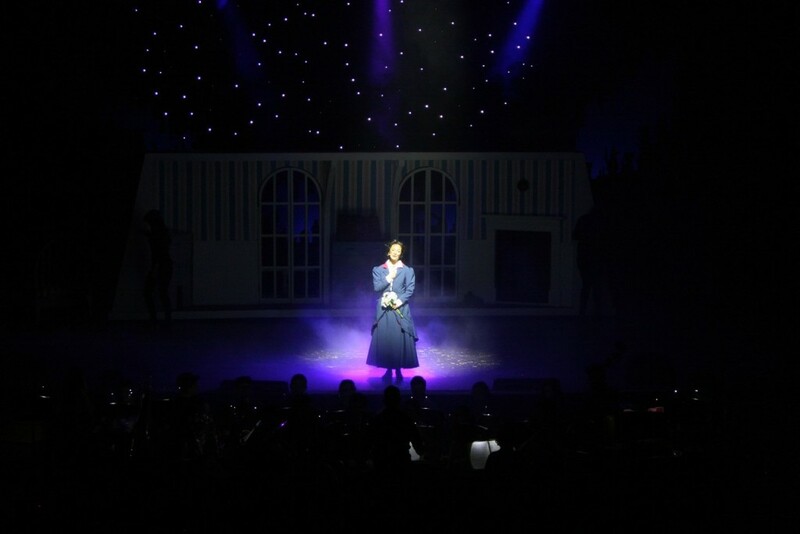 This timeless lighting design combined with the traditional visuals of swags and jabots takes the audience back to the 1940’s. We miss Dolores dearly – the recent passing of the Cranberries lead singer certainly came as a shock to us here at Sew What? 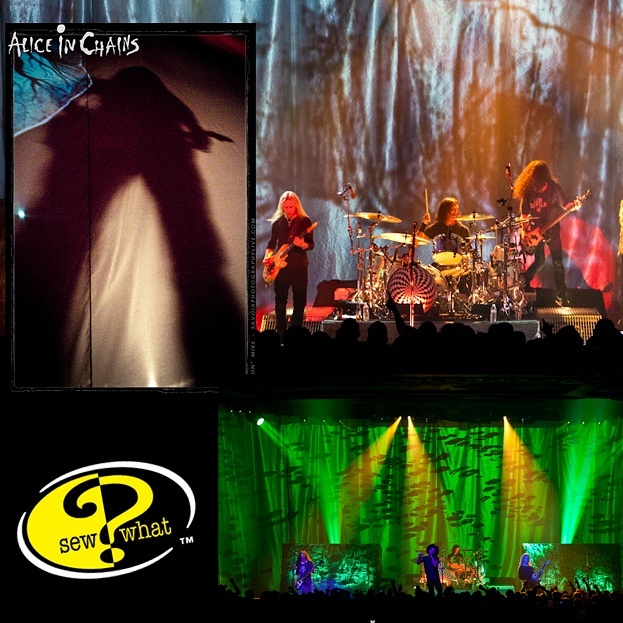 Inc. We had many opportunities to supply softgoods over the years to this band, and our Silver Satin Collection was a go to for use on their tours. 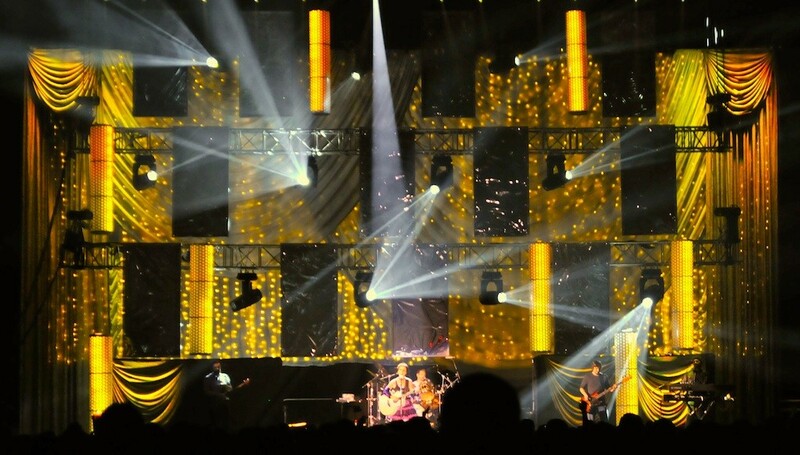 Seen here, the Cranberries designer combined custom hard-set elements on fly bars to add depth to the stage and bring a thoroughly modern look to the design. 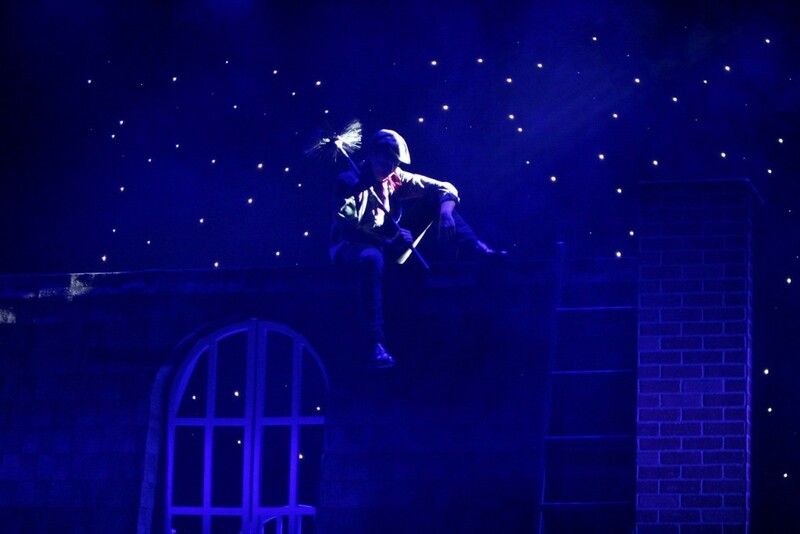 Add in our low-tech LED light strings as seen in this photo, and a whimsical world appears. Fun design hint: See how the client added small silver swagettes at stage level to back the individual players? What a unique way to create spectacular photo-opportunity backgrounds for the concert photographers when taking close-up shots of the artists. Does your design call for a variety of bright lighting palettes? Red – Blue – Purple? That’s not a problem. These glossy silver tones take primary reds and blues with no issue. 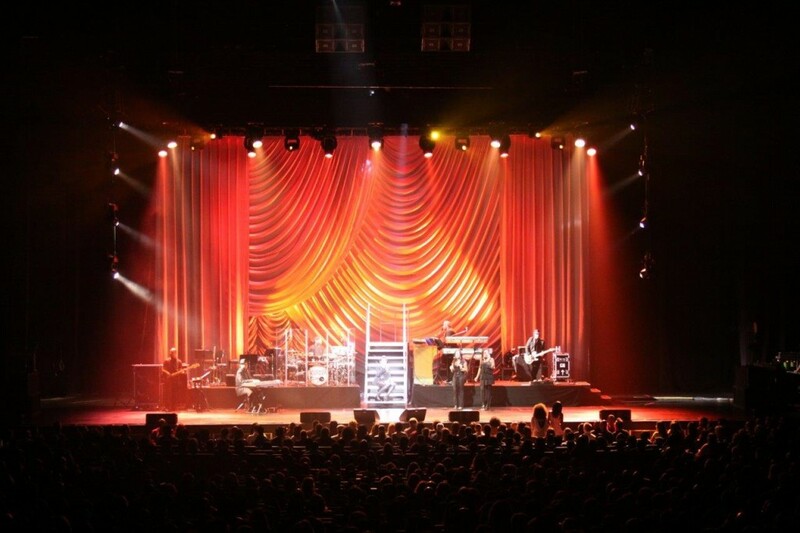 Check out our 30’h x 60’w Silver Crushed Satin Austrian Stage Drape under LED stage lighting on a recent Lady Gaga tour. 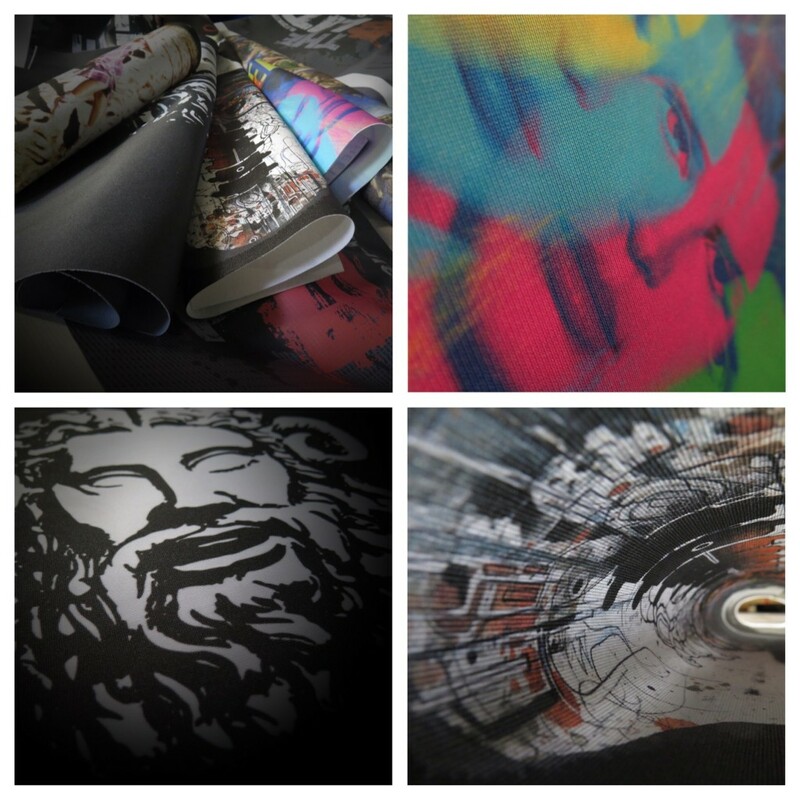 As you can see – the versatility of silver cloth is unrivalled. And last, but not by any means least…………….. Combine pieces from more that one drapery collection for the ultimate mix and match opportunity. Seen here at the 57th LA County Holiday Celebration, a LED stardrop from our Starry Night Stardrop Collection is combined with a silver satin swag from the Silver Satin Collection. 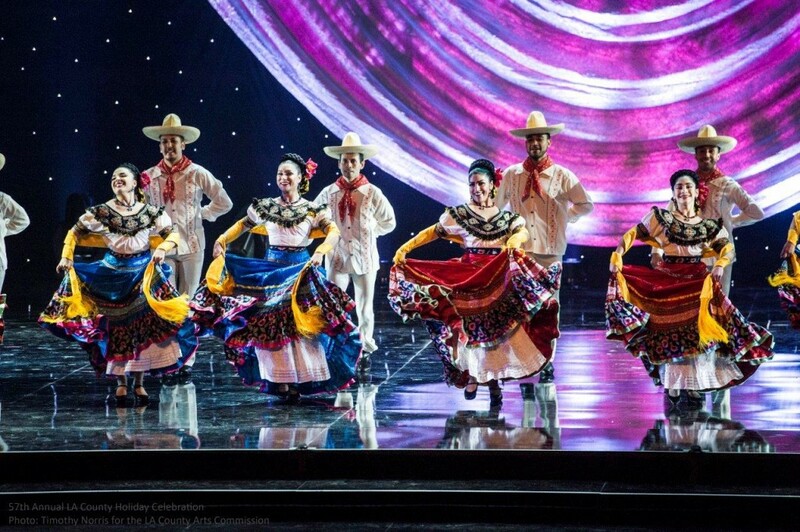 Costumes, dancers, lights, sound, music. 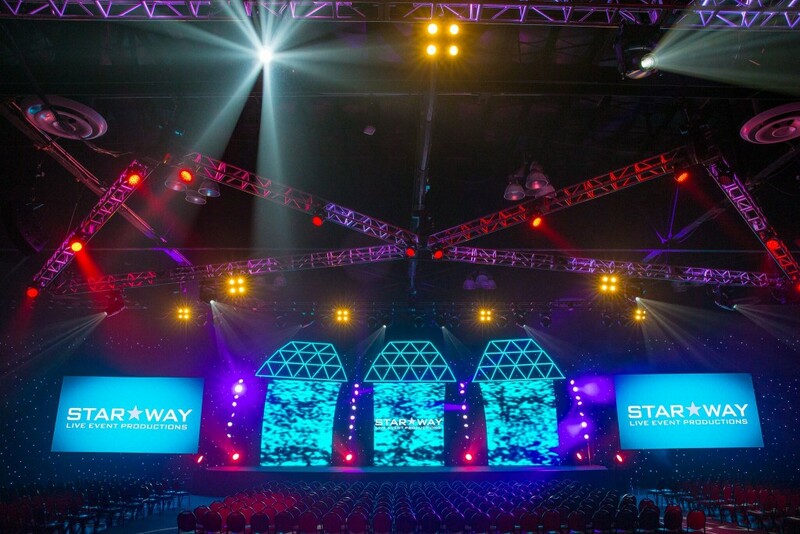 The stage is sparkling with excitement, and our stardrop backdrop and satin swag certainly provides the perfect background. Far more than stage curtains and theatrical drapery. Just like your audience, you want top performance. Sew What? delivers! 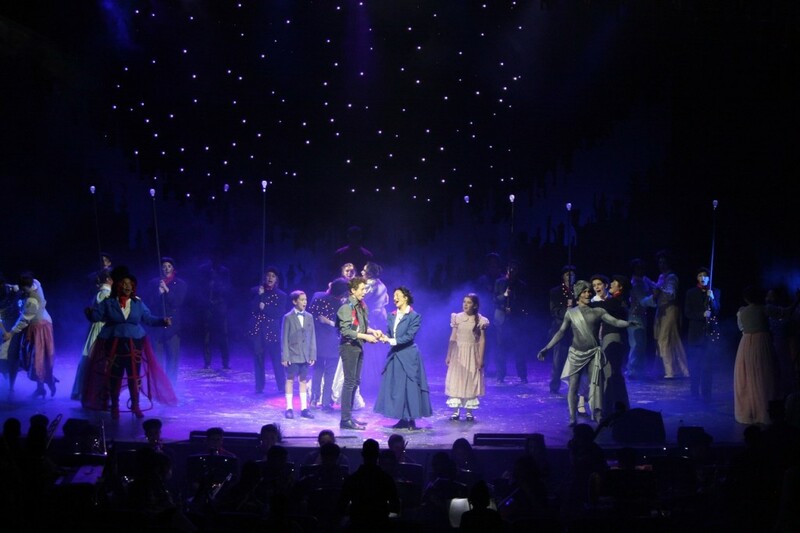 Our Stage Curtains and Theatrical Draperies, Stage Backdrops, Curtain Tracks and Theatrical Supplies exceed your expectations and enhance your shows and events. With experience that ranges from the hottest rock concerts to the biggest theatrical events, to school auditorium performances, and just about any other kind of production under the sun, Sew What? is the answer. 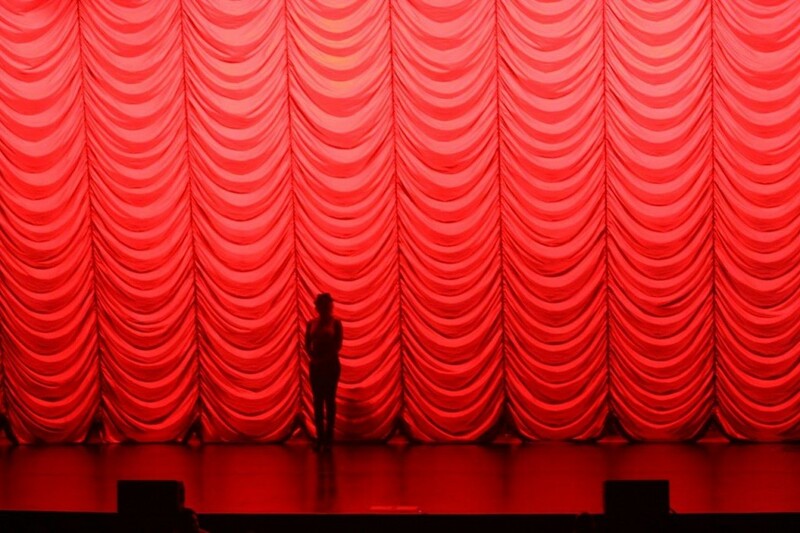 Click here to contact us or call us at (310) 639-6000 for information on our wide selection of rental drapery and custom drapery fabrication services.